One surprising development in the growth of multinational businesses and international trade is the large and growing amount of intra-industry direct foreign investment. Intra-industry direct foreign investment is the phenomenon whereby multinationals from two countries have overseas manufacturing operations in each other’s countries. The phenomenon is surprising because it contradicts the notion that some countries are technology exporters and others merely receivers, as well as challenging the idea of the existence of an international division of labour. It suggests that international trade is taking on a new form and this raises important implications for government regulators, for consumers and for multinational businesses themselves. 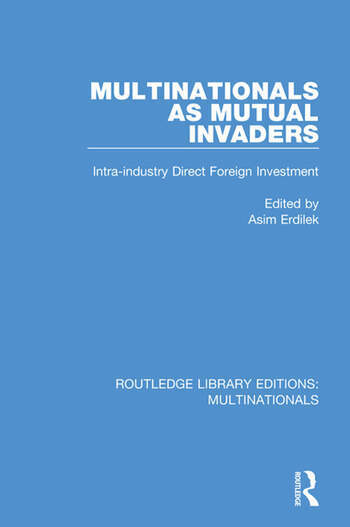 This book, first published in 1985, explores the nature of intra-industry direct foreign investment and the issues raised by it. This title will be of interest to students, researchers and policy-makers interested in international trade and multinational business.